When I was younger, my friends in The Netherlands loved surfing. They took every opportunity to ride the waves. With their handmade wooden bike carriage they carried the board wherever they wanted. Free minds. Once in my teens I took wind surfing classes on a lake near us. I don’t know exactly why I quit. My love for horseback riding was much stronger or because of my feet sucking into the mud every time I fell off the board. Maybe both. But the ocean has always been that magical magnet attracting me. It wasn’t until I went on a surf and yoga retreat in Sardinia, that I jumped on a board again. There I found out surfing and yoga go well together. It’s both extremely good for your physical and mental condition. It makes your core super strong and flexible. In the Yaeyama islands I had my first SUP experience. And I have to say, it’s so much more easy than wave or wind surfing. Open to everyone basically. Ishigaki island is the best place to try this, because the clear ocean is flat most of the time and the view is absolutely stunning as you can see on the video we took near my favourite beach in the North of Ishigaki. I did a SUP yoga tour with a lovely teacher. Standup paddling is relaxing and the good thing about it is, you don’t feel your working out. Practicing yoga on the board is quite a challenge though but after you get the hang of it, it’s really fun! For experienced yogi’s SUP yoga isn’t that difficult and adds a fun extra dimension to your practice. Visit Dive in tropical Japan – Ishigaki island – for more video’s about Ishigaki island. 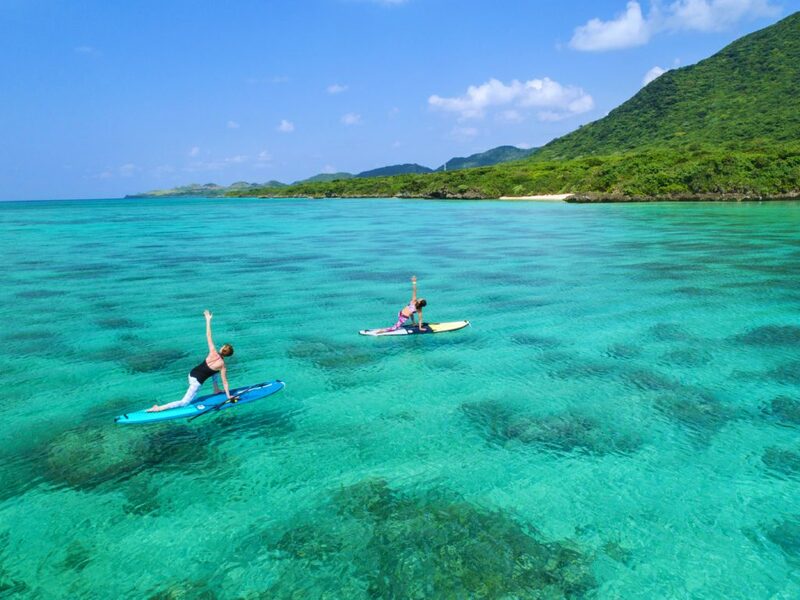 The SUP tour I took with Blue Shell Ishigaki SUP Yoga fit.